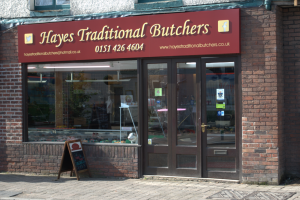 Located at 276a Warrington Road in the centre of Rainhill, Hayes Traditional Butchers occupies a site that has been home to a butchers shop for two hundred years. Hayes is an independent butcher that caters for all your needs when it comes to meat requirements. All of our cooked and oven ready meats are prepared in the shop. No matter if it is beef, chicken, lamb, pork, sausages, bacon, burgers or grills they are readied on the premises for you, the customer, who is our top priority. We always go the extra mile to ensure you have what you ask for and can deliver to your home if your order costs more than £20. 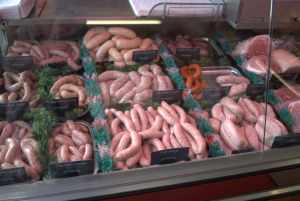 Amongst the products made in the shop are our sausages, some of which are gluten free, which have won awards across the North West. We have a wide range to choose from ranging from the traditional pork and beef to those with an unusual twist, such as chippy curry and Mexican chilli. 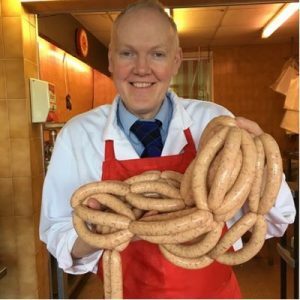 You can include these sausages in a full English breakfast and add our store cured bacon, free range eggs and home made black pudding. Many of our oven ready poultry products have breadcrumbs and they are all prepared in store. This includes our delicious chicken kiev which has the garlic butter added too before being wrapped ready for you to purchase. All our chicken is free range and we also have a chicken that is reared in open barns in Scotland. This has been sourced from a reputable independent company that does not supply mass products to supermarket chains. Scotland’s top red meat supplier Scotbeef Limited supplies beef to Hayes Traditional Butchers. They only source the best quality livestock and export worldwide. Their standing is shown by them having the Royal Warrant, enabling them to supply meat to the Royal Household at Balmoral. The Lythe Valley in Cumbria is where we get our Salt Marsh Lamb and we also source from the Yorkshire Moors and Scottish Highlands according to the season. In addition to Hayes Traditional Butchers supplying you with the finest quality meat, we can also assure you that is has been prepared and stored correctly. Anthony has over thirty years experience as a butcher and is an Associateship of the Institute of Meat. He has studied at Salford University for qualifications that include Advanced Food Hygiene and an HNC in Foot Industry Management. In store we cut no corners when it comes to hygiene standards. The shop makes use of a HACCP (Hazard Analysis and Critical Control Point) system, controlling temperature on a daily basis and strictly monitoring hygiene procedures. This ensures that the meat has been kept safe during its handling, preparation and storage. When you purchase our products, we are always happy to offer advice on how to keep them safe until you are ready to cook or eat them.